Spark Plug Cleaning | Utah Carbon Cleaning LLC. How do spark plugs get dirty? Correct ignition and complete combustion of the fuel-air mixture are the most important factors in determining engine efficiency and performance. To ensure proper ignition, the flow of sparks between the electrodes of each spark plug must occur at the right time in all circumstances and produce the correct ignition of the fuel-air mixture. 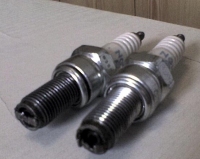 It is essential that the type of spark plugs used correspond to the characteristics of the engine. They must be hot enough to prevent saturation at low revs, but at the same time should not overheat and thus become a concern for pre-ignition, i.e. ignition of the gas mixture prior to the production of the spark. When spark plugs are in poor condition, or when spark plugs that do not correspond to the engine type are used, what results is a bad ignition of air-fuel gas mixture. This ultimately results in unbalanced combustion, in which case only a portion of the fuel is converted into energy. The unburned gasoline then passes through the piston rings and into the crankcase where it dilutes the engine oil. What’s left discharges through the exhaust system, polluting the air. The most expensive option is the outright replacement of the part. This is what most mechanics will propose. The price of the component varies to the brand and type of spark plug. The moderately expensive option entails a bit more time as well as some mechanical skills. This involves the removal and cleaning of the spark plugs with a wire brush. Make sure to check the electrode gap setting. For some vehicles, the spark plugs are not easily accessible.